Half time of the run in women's race: Zelinka leads by 1:21 over Tondeur and 2:11 over Pedersen. 12 seconds - Andreas Boecherer has made it. 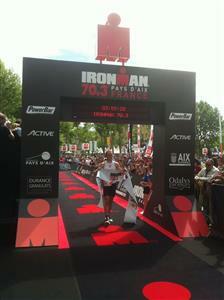 He takes the win after a very hard time of recovery: Andreas Boecherer wins IRONMAN 70.3 Pays d'Aix in 3:57:21. Boris Stein is runner-up in 3:57:33. 23:09 / 2:12:21 / 1:16:49 - that are the splits of Andreas Boecherer. 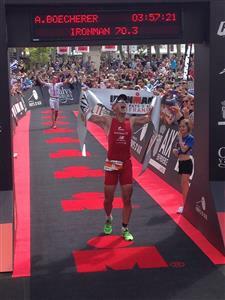 Jan van Berkel takes bronze medal in 3:59:30 just a minute ahead of Ritchie Nicholls (4:00:34). What a finish! Fast half marathon splits for Nicholls (1:14:09) and Stein (1:14:27). 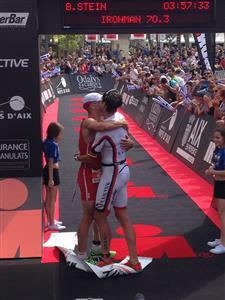 Sensational photo after a sensational race: Andi Boecherer makes it 12 seconds ahead of Boris Stein. German happiness: Andi Boecherer celebrates with Boris Stein after a great race. Third place for Jan van Berkel. Update Women Km 15.9: Zelinka is 1:59 ahead of Tondeur, Pedersen at 2:37. Women's race Km 18.4: Zelinka leads by 2:09 over Tondeur. Pedersen is still not too far away from silver (2:48). 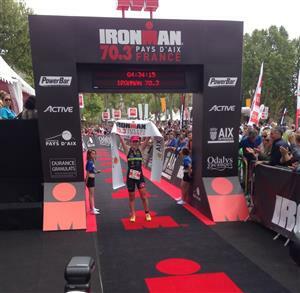 Gabriella Zelinka from Hungary takes the crown at IRONMAN 70.3 Pays d'Aix. She wins in 4:33:32. Alexandra Tondeur takes silver in 4:35:49. Camilla Pedersen rounds up the podium in 4:36:37. Happy silver medalist: Alexandra Tondeur is today's runner up. Great day, great race: Gabriella Zelinka. 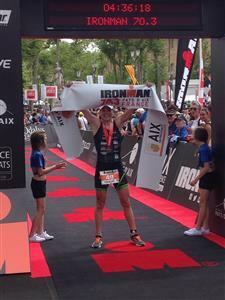 Champion at IRONMAN Pays d'Aix. Corina Hengartner from Switzerland takes fourth place in 4:48:03.